For Clint G_______, one of my very first friends on the Wasatch front, and a very Fortean-kind-of-guy. Several months ago, Robert Schneck came up with a list for the Top Seven USA Fortean Wonders. He writes that he was inspired to do so by Loren Coleman, who was inspired by the announcement of the New Seven Wonders of the World. I was inspired to come up with my own list, albeit much more focalized and localized. I quickly came up with Seven Utah Fortean Wonders, and posted them on my blog. Although after considering some points commenters made, and really ruminating on it, I feel my original list needs some revision. In honor of my last full week in Utah after 18 years, I thought it fitting to write about its rich Fortean history. Below, in no particular order, are the first 3 of my revised list along with brief descriptions, commentary, and links to more fully explore the stories. For the remaining four wonders, see part II, posted on 4.4.8. The legend goes somewhat like this: early in the Mormon Pioneer settlement days in Deseret (Utah’s original state name) in 1848, spring crops were becoming ruined by cricket infestation. Many methods were used to try to get rid of the menacing crickets, alas, nothing worked. However, after a last resort of fasting and fervent praying, the sky became dark with thousands of seagulls descending out of nowhere; the birds ate the crickets, vomited them up, ate more crickets, and repeated this cycle until all the crickets were gone. The birds saved the crops, and ultimately, the pioneers. It was seen at the time as divine intervention, and is still largely revered as such by most LDS members. This event, although known now to be quite within the realm of ‘normal’ is certainly serendipitous and unquestionably fortunate. The seagull is the state bird of Utah, and there is an iconic seagull statue at the gateway of the flagship LDS Salt Lake Temple. John Hyrum Koyle, a pioneer son, farmer, and later, Mormon bishop, after having verifiable prophetic dreams, promised God he would follow instructions and indications if his ‘gift of dreams’ were to continue. He believed they did. "…the most important dream of all came to him Aug. 27, 1894. On that date, an angel visited Koyle in a fitful dream, urging him to dig a mine. This mine would lead to nine vaults filled with the treasures of the Nephites, descendants of Lehi, an Israelite prophet in the Book of Mormon. Lehi's son, Nephi, is best known for rescuing the golden plates-from which the Book of Mormon would eventually be translated-and for leaving Jerusalem for the Americas. The angel guided Koyle through the mountain itself. They passed effortlessly through miles of rock and dirt, which revealed rich veins, tunnels and the vaults. Climbing the mountain several days later, Koyle saw a strange circle of light on the hill-the very halo of light the angel told him would mark his first dig. Koyle would have numerous visions-from predicting two world wars, the Great Depression and nearly every development in the progress of the mine before it happened." Koyle was eventually excommunicated from the LDS church—his obsession was apparently seen as a dangerous and dark, misleading. There is apparently a fine, random and quantum line between personal revelation and apostasy. The story is not finished, even now, over a century later. A mill still stands at the site of the mine, and there is apparently considerable interest by treasure hunters and the apocapalyptic-minded in finally finding the riches untold. Most people are familiar with the mysteries and love stories behind the monuments of Coral Castle, Taj Mahal and the like. Salt Lake City has its own stoney, folky love poem. Gilgal Garden was created by former LDS bishop Thomas Battersby Child Jr., and his sidekick, sculptor Maurice Edmund Brooks, beginning in 1945, until Child’s death in 1963. Although there are no otherworldy suppositions about the mechanism or manner of construction, the reality is just as outrageous—Child purportedly hauled boulders for his creations—some weighing 72 tons—in the back of his truck. Child’s inspiration is not the love for a woman, but the love of the gospel, of his LDS faith. How very wonderfully Utah. The overall effect is a very personalized and intimate, larger than life, fabulously bizarre folk-art sculpture-smorgasboard. 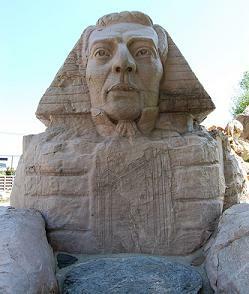 Some of the 12 sculptures include a sphinx with the head of founding Mormon father Joseph Smith, a statue of Child himself, wearing brick pants, and surrounded by tools. In addition to the large sculptures, there are 70 stones with various inscribed text. In part II, I will introduce the last of my Seven Fortean Wonders of Utah, including a largley overlooked alien-inspired religion and pyramid. I’ll also have a list of Fortean contenders that didn’t make my list. I the meantime, I welcome suggestions to add to that list. I also challenge bloggers to come up with their own local Fortean Wonders lists. It’s great fun. Hosanna!